What can I say about the Highlands of Scotland that has not already been said? So many articles have already been written about this beautiful part of Scotland, so I will give you my take on it from a purely personal perspective. You may wonder what qualifies me to write about this subject. Well several things, firstly I am a Scotsman I was born in Inverness, the "Capital of the Highlands". Well that`s what they call it, but the title is not official. I lived and worked there for the first thirty eight years of my life and am the proud owner of a kilt and all it's accessories. I still have many family members and a great number of friends living in various parts of Scotland, so hopefully that qualifies me to speak first hand about my homeland. The Highlands have many wonderful attractions that make it a destination well worth a visit, in fact a large number of its visitors return again and again, there is so much to see and do. The country is steeped in history going back many hundreds of years. There are countless castles, stately homes, and many ruins, lots of which give guided tours, in several languages. Loch Ness ( with its world famous monster) does it exist or is it only a myth? decide for yourself, after having visited. Perhaps you'll catch sight of her (a good photo would make you both rich and famous). On the banks of the loch (Scottish word for lake) at Drumnadrochit you will find the official Loch Ness monster exhibition, acclaimed by Nessie hunters around the world. 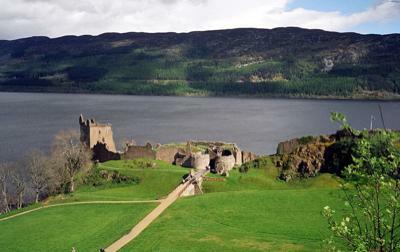 And in the same picturesque village stands the ruins of Urquhart Castle, overlooking the loch and dating back to 1296. Only a short drive from Drumnadrochit, approximately 15 miles lies Glen Affric, often described as Scotland's most beautiful Glen. The entire area is a National Nature Reserve and also a Caledonian Forest Reserve (it contains one of the largest Caledonian pinewoods in Scotland) as well as lochs moorland and mountains. Speaking of mountains the Highlands of Scotland boast the highest mountain in the British Isles, Ben Nevis. It lies at the western end of the Grampian Mountains, close to the town of Fort William, it is 1,344 meters above see level (4,409 feet) and attracts an estimated 100,000 walkers and climbers a year. It was first climbed on August 17th 1771 (which happens to be my birthday) by James Robertson, a botanist from Edinburgh. In 1883 they built an observatory on the summit, at the same time building a pathway, which to this day makes the summit accessible to just about anybody. An ideal base for touring this beautiful part of Scotland is of course Inverness, conveniently situated with road rail and air links to all other major cities in Scotland and the UK. When I lived there it was a town, but in March 2001 it was granted city status. 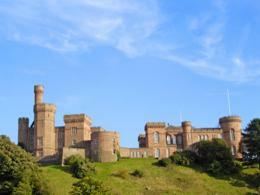 The castle overlooks the beautiful river Ness. Inverness has a host of historic buildings in the old town, and the splendid Saint Andrews cathedral (I sang in the choir as a boy treble). The city boasts many fine restaurants and pubs, offering fresh local produce to suit most budgets, from good pub grub to ä la carte. Also accommodation ranging from bed and breakfast to elegant four star hotels, is widely available. And the most important element of all, the unsurpassed warm Highland welcome which makes a visit to the Scottish Highlands an unforgettable experience.